The above photo of the Calais Academy Class of 1906 touring Washington has led us to ponder what sort of experience it was for this group to travel to the nation’s capital near the turn of the 20th century. It certainly have been a great adventure to travel by train for nearly 800 miles. Calais didn’t have a direct connection by rail to Bangor until 1899 so most probably had little experience with train travel. It’s also doubtful many would have traveled even by steamship as far a Boston. 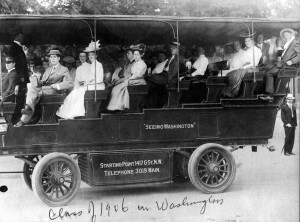 The class surely would have been amazed by the sights and sounds of the capital, not to mention the heat and humidity, and a bit astounded to be riding about town in a conveyance not drawn by a horse. The first car came to Calais less than three years before this photo was taken and it was a small electric model, more a toy than a practical vehicle. For many riding this bus would have been another first. The driver of the bus didn’t have a license. The only country requiring driver’s licenses for motorized vehicles in 1906 was the Netherlands. Elsewhere in the world Mount Vesuvius erupted and devastated Naples and the San Francisco earthquake had flattened the city just two months earlier. The London and Paris metros opened and the Cunard line launched the largest passenger vessel in the world, the Lusitania. It remained so until May 1915 when German submarine U-20 sent it to the bottom in sight of the Irish coast with a loss of over a thousand passengers and crew, many American. Finland voted for universal suffrage except for the poor and Dreyfus was found innocent by a French court after years of legal and political conflict. European colonization continued in Africa with King Leopold announcing the Congo was now his “private possession” much to the dismay of the English, French and Italians who retaliated by declaring Ethiopia to be independent which they promptly divided among themselves. The US invaded Cuba, occupying it until 1909. President Teddy Roosevelt had a good year. He won the Nobel Peace Prize for mediating a peace treaty between the Japanese and the Russians and he became the first sitting President to visit a foreign country, Panama where the canal was then in full operation. The Wright Brothers patented an airplane, a European flyer finally got off the ground and Carrier patented the air conditioner, a development which changed the world perhaps even more than the airplane. 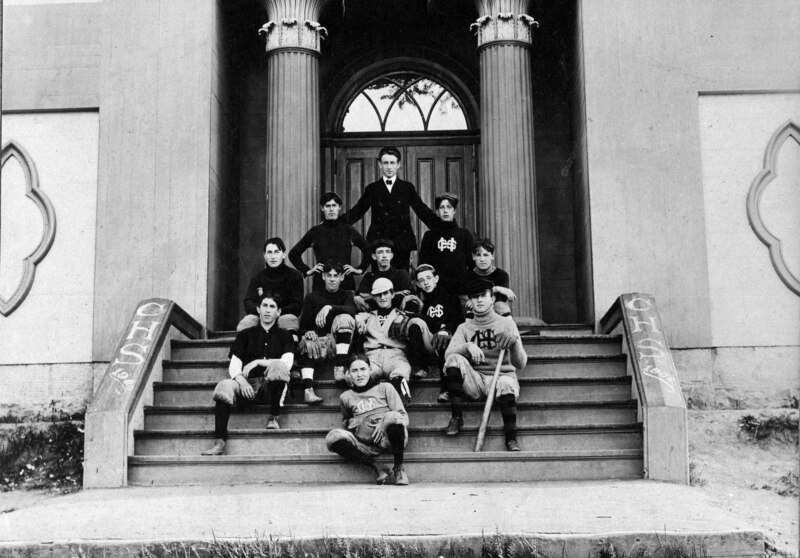 In sports, baseball’s Cubs finished with a record of 116-36, by far the best in the history of the game, but lost the World Series to the hometown White Sox 4 games to 2. 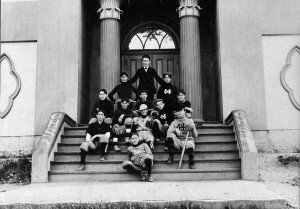 The New York Highlanders played doubleheaders with Washington on three successive days and won all six games. 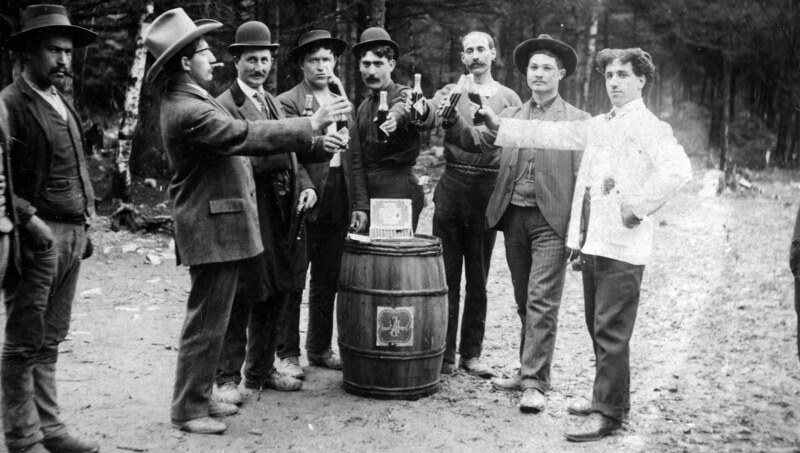 The first commercial radio hit the market for $7.50- it had a reception range of 1 mile. 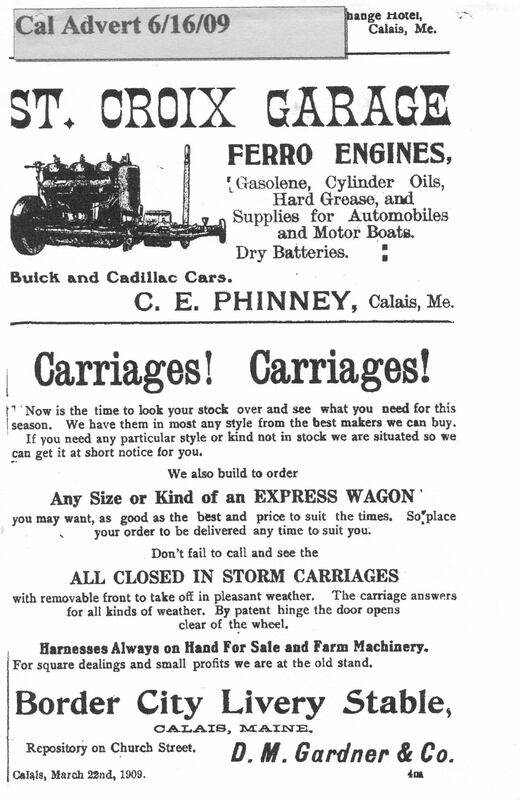 The above advertisement in the Advertiser provides an indication of how times were changing in Calais in 1906. Charles Phinney came from St Stephen in the late 1800’s and opened a bike shop near where Roger’s Body Shop is now located. With the advent of the automobile Charles recognized times were changing and that there was money to be made selling horseless carriages. He owned the third auto in town and opened the first garage to sell and maintain cars and provide gas and oil. D.M. 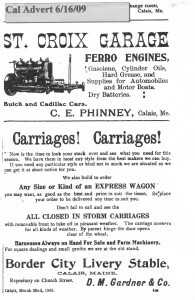 Gardiner, however, continued to sell carriages and wagons at an ever decreasing rate until finally all the old carriage shops had become automobile dealerships. 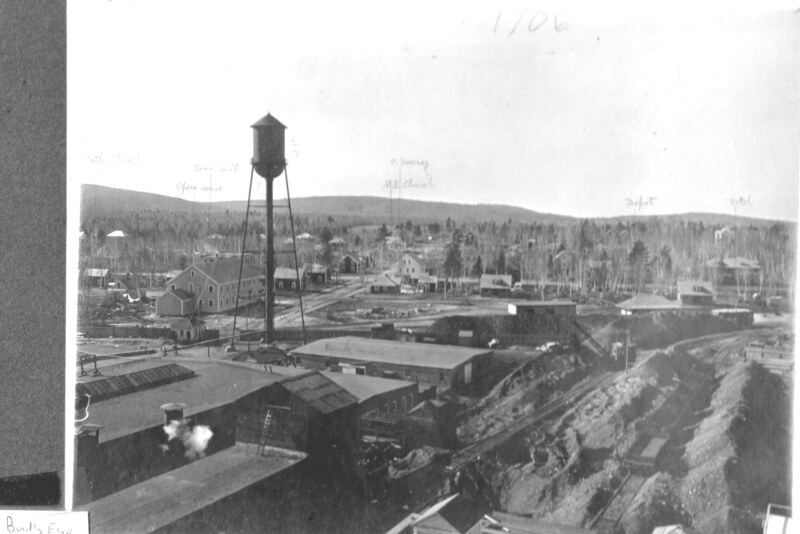 The fall of 1906 was a milestone for Woodland. The new paper mill produced its first ground pulp on August 18th and started the its first paper machine on September 29 and its second on October 9th. 300 people were employed in producing 90 tons of paper every day. 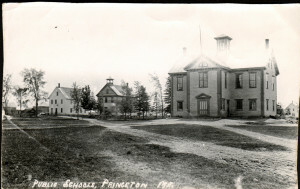 While much of the town remained to be built, the photo does show both the Opera House and the Methodist Church were already in place. The mill was built by about 1000 Italian workers. 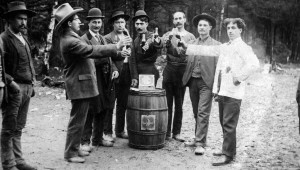 Here Mike Foggia and a few of them toast their accomplishment in a 1906 photo. 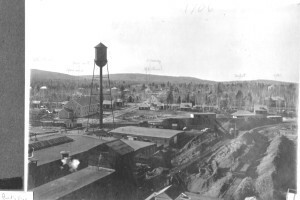 In January 1906 Red Beach was abuzz with the attempted robbery of the stores and Post Office. 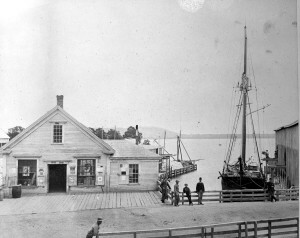 The robbers broke into the store at Plaster Mill Cove, shown above, and then into the blacksmith shop where they obtained the tools necessary to get into the Post Office safe. The watchman for the Plaster Mill, James Brown, confronted them and both drew revolvers, firing 5 shots at Brown who was seriously wounded. They fled the scene but Brown managed to crawl into the road where he was found by a young woman who fortunately for Brown was going to the doctor’s office to assist in another emergency. The authorities didn’t take long in rounding up the “usual suspects”, Henry Marshall and his Italian friend Guiseppe Quarterlone who seemed suspicious enough to have committed the crime although there was not a shred of evidence to support their guilt. Even the towns folks were of the opinion they were innocent but the two, although ably represented by H.J. Dudley, were held on $5000 cash bail and sent to the Machias jail. Only later was it discovered that a boat had disappeared from Red Beach that night and was found abandoned in St Andrews. A new line of inquiry eventually led to the arrest in St. John of William Phelps of Calais and a notorious escaped convict named John Ashton. When arrested they were carrying three revolvers and a couple of knives. 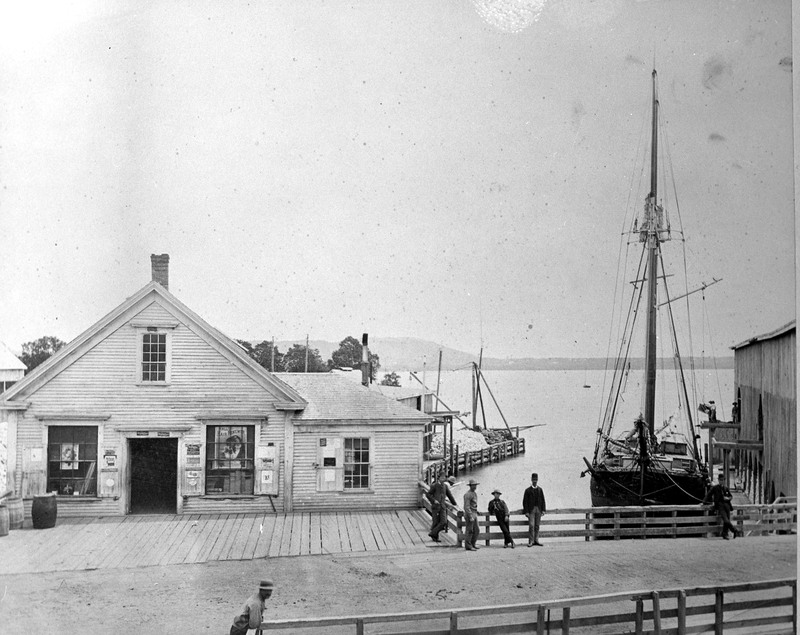 They might not have have been connected with the Red Beach crime if a St John constable had not recognized Phelps as a former mess boy on the steamer State of Maine with whom he had sailed 9 years before. Both were transported to Portland to stand trial on the Post Office burglary which was seemingly a more serious a crime than shooting the night watchman. 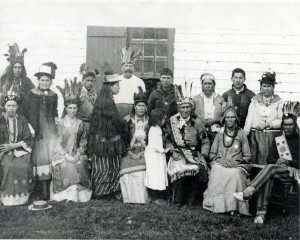 A nice photo of some the members of the Passamaquoddy Tribe in 1906. Charles Rolfe was the Maine agent for the tribe and reported the tribal population as 458 on December 19, 1906. There had been 14 births during the year and 18 deaths, 4 attributable to consumption and two to the drowning of Joseph Gabriel and his wife. and we’ll end with a photo of the Princeton Schools in 1906. All these buildings are, we believe, gone.